There's nothing quite like a hot cup of coffee (or two ... or three) to start off the morning. Coffee consumption is a beloved American tradition, after all. But with an increased emphasis on green living, some people are under the impression that they may have to forgo their daily dose of caffeine because of unsustainable practices. When people think making their coffee at home is better for the planet, your business could suffer as a result. The truth is that there are plenty of ways to implement more eco-friendly options for coffee in your establishment. We'll look at just three of them below. Long gone are the days when styrofoam cups were acceptable. Even regular paper cups might seem wasteful if you don't have an in-depth recycling program. A great alternative to paper, plastic, and foam is the compostable coffee cup. Made of organic materials, these coffee cups are both compostable and biodegradable. That means that whether it ends up in the garbage or in your compost bin, these materials will break down naturally into the environment without causing any harm. Best of all, they're strong and high-quality, which means they can be used for hot tea and coffee or iced beverages. When your customers can enjoy their cup of joe without all the added guilt, they'll be more likely to come back to get their fix. Organic coffee beans are grown without synthetic and harmful chemicals, which means they're safer to consume and frankly taste better. Buying organic means you support practices that don't pollute the earth or the product you're selling. Around 85% of organic beans are also Fair Trade. This certification means that the farmers responsible for growing the beans are fairly compensated for their work. When growers can earn a fair wage, they're more likely to have pride in what they grow -- and are therefore more likely to produce higher quality beans. Both of these designations will have a positive impact on the taste of your coffee and will give customers the satisfaction of knowing they're helping the planet and independent farmers. The majority of your customers probably don't drink their coffee black. 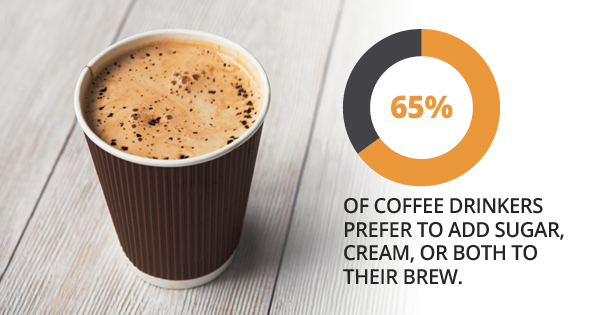 In fact, 65% of coffee drinkers prefer to add sugar, cream, or both to their brew. Instead of putting out plastic stirrers, consider offering wooden stir sticks instead. Some people might think using wood for this use is responsible for killing trees, but they're actually considered to be a sustainable resource because they're compostable and biodegradable. That means that they can go right back into the environment and eventually create new life. Plastic stirrers aren't able to be broken down as easily, creating far more waste after they've been used. But wooden stir sticks don't present any harm to the environment after they've served their purpose, so they're a much more eco-friendly option.